Quake® Champions Official Website | Choose a Side and earn your team rewards! Choose a Side and earn your team rewards! With the arrival of the latest Champion, Eisen, things are heating up as the ragged space captain reignites his grudge with Clutch – the murderous mining automaton Eisen holds accountable for the death of his loved ones! As lines are drawn in the Arena, it’s now up to you to Choose a Side! Team Eisen includes: Nyx, Slash, Visor, Ranger, Sorlag, Strogg + Peeker & B.J. Blazkowicz. 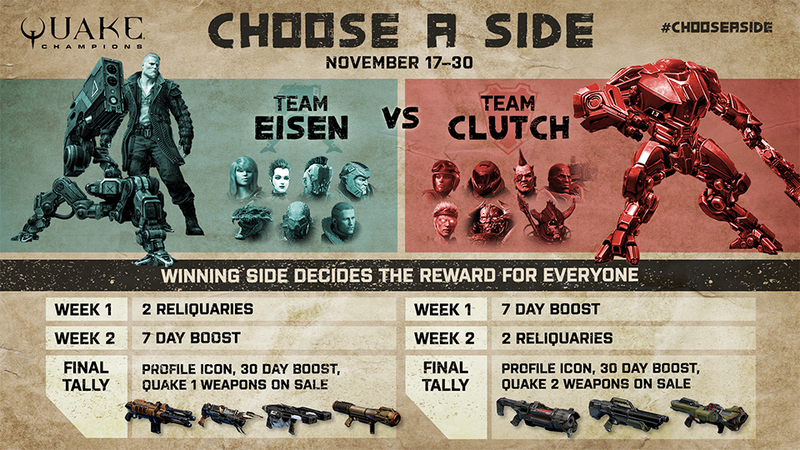 Team Clutch includes: Athena, DOOM Slayer, Anarki, Keel, Galena, Scalebearer & Death Knight. Note that all players that participate each week receive rewards regardless of their allegiance – the leading team just establishes which reward the community receives! After the second week concludes a final tally will be conducted of scores to decide a winner, earning all participants a 30-Day XP Boost, profile icon and a special deal in the Store for either the classic Quake or Quake II weapons! During this event, ALL Champions will be available to play in the free rotation! Frag for your team with the Champion(s) you want to play in all game modes! There’s no time to dawdle – head into the Arena and Choose a Side! Whether you side with the sentry-toting redhead Eisen or his mechanical menace Clutch, be sure to share your progress on social media with #ChooseaSide and follow Quake Champions on Twitter for the latest updates.